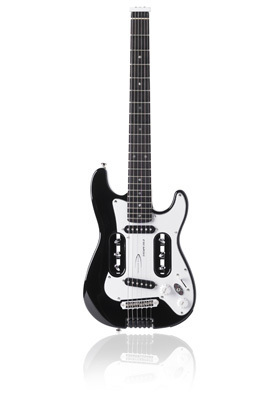 EG-2 - Black, Other Electric Guitar from Traveler Guitar. 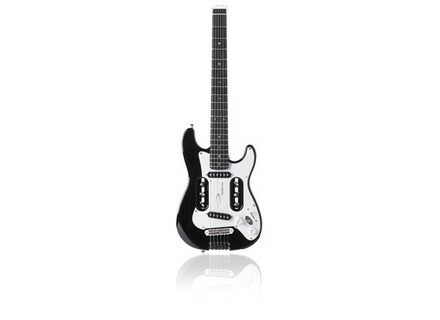 The Traveler Guitar EG-2 is a full 25 1/2”-scale electric guitar featuring a compact double-cutaway body shape, 3-ply pick guard, maple neck & fretboard and a classic black finish with white pickup covers. At 29 1/2” long, the EG-2 is designed to stow in airline overhead compartments and weighs about 5 pounds. Two single-coil pickups feed into the EG-2’s built-in Pocket RockIt headphone amplifier. Players can also go passive into their amp of choice. The EG-2’s onboard electronics include a 1/8” AUX IN jack so players can jam with tracks from an external device such as an mp3 or CD player. Additional controls include Tone & Volume knobs and a 3-way pickup selector. The Traveler Guitar EG-2 also features more traditional guitar features such as an alder body, standard strap pins and an adjustable truss rod. Includes Deluxe Gig Bag and comes standard with D’Addario EXL-110 strings. Electro-Harmonix Ravish Sitar Electro-Harmonix introduces the Ravish Sitar pedal, which transforms a guitar into a sitar. T-Rex Engineering Tap Tone T-Rex Engineering, in partnership with Guitar Center’s Director of Merchandise, Barry Mitchell, announce Tap Tone, the second of a series of four new pedals which will be available exclusively at Guitar Center stores and online at www.guitarcenter.com. Vintage VRC800AMF The successful Vintage line of resonator guitars has introduced a new member, the VRC800AMF.